I am so glad Grandma Dowdel had returned! And this is a whole new story. A new family (Grandma's new neighbors)have moved in and Grandma Dowdel helps her in her own special way. ;) I absolutely love Richard Peck's humor and character development. This book is a follow up book to A Long Way From Chicago and A Year Down Yonder, but you do not need to read the first two to enjoy this story. However, if you want a little background in the development of Grandma Dowdel, you will not want to miss the first two books. I recommend this book to 6th, 7th, and 8th graders. Although some of fifth graders in my class get into reading the other two books, I think the vocabulary of this book makes it more appropriate for 6th grade. But I would surely start them off with the series in fifth grade. I especially like the version on tape I have borrowed from the library. 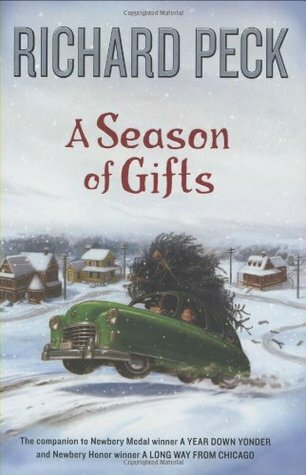 Sign into Goodreads to see if any of your friends have read A Season of Gifts.